After soldering more and more complex electronic circuits it was time to do something with a computer. In 1977 I've made my very first computer. In fact I intend not make a computer, but a circuit to decode RTTY from radio news stations. Normally this was done with a Teletype printer, but these things were very large and heavy. Therefore I bought a video display with 16 lines and 64 characters. This video display was called "Ikunullius" and was a project of some Dutch Radio Amateurs. The RTTY decoder had a 5 bit serial output (Baudot code), while the video display had 8-bit parallel input. 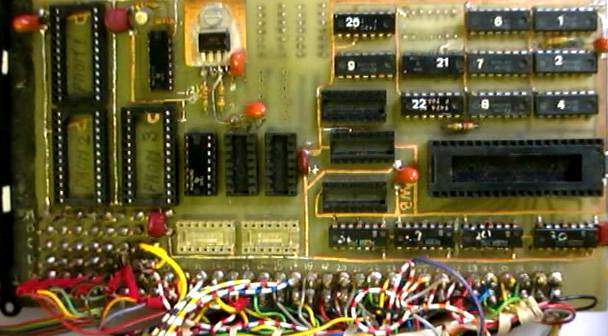 There was a need for a complex decoding and conversion circuit. It had to translate the 5-bit Baudot code to 8-bit ASCII. 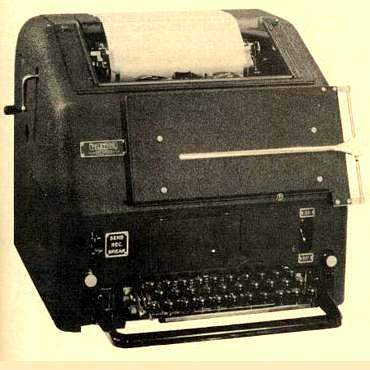 In fact it was the ideal application for a simple microprocessor. After reading a lot of books and documentation (no, not on Internet) the SC/MP from National Semiconductor was chosen. Mainly, because of the company who sold it was very close. Since I had no experience with computer construction, it was handled as any other electronic project. To enter the very first program it had a DMA circuit with eighth switches to set the data and 16 switches for an address.